Pet Emergency? Call us right away at 918-663-5758! Marina Animal Clinic is the largest clinic in Northeastern Oklahoma. If you live in Tulsa or the surrounding area and need a trusted veterinarian to care for your pets – look no further. Marina Animal Clinic's 7 associates, are licensed Oklahoma veterinarians, treating all types of pets. Your pets’ health and well being are very important to us, and we take every possible measure to give your animals the care they deserve. Marina Animal Clinic is a full service animal hospital and welcomes both emergency treatment cases as well as pet patients in need of routine medical, surgical, and dental care. Our associates have years of experience treating serious conditions and offering regular pet wellness care. Beyond first rate pet care, we make our clinic comfortable, kid-friendly, and calm, so your pet can relax in the waiting room and look forward to meeting the veterinarian. We are happy to offer a number of resources that enable you to learn about how to take better care of your pets. Please feel free to browse our site, particularly the informational articles. The best veterinary care for animals is ongoing nutrition and problem prevention, so becoming knowledgeable about preventative pet care is essential to the ongoing success of your animal’s health. If you have any questions, call 918-663-5758 or email us and we'll promptly get back to you. Our office is very easy to get to -- and you can find directions on our Contact Us page! We also welcome you to subscribe to our newsletter, which is created especially for Tulsa pet owners. 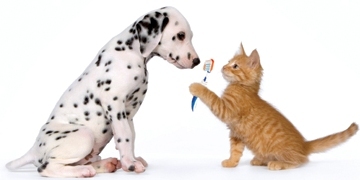 At Marina Animal Clinic, we treat your pets like the valued family members they are. See a receptionist for any questions. September 28 is World Rabies Day! We will be offering one year rabies vaccines for only $8! From 10 am until 3 pm, during vaccine clinic. ANNUAL PIT BULL APPRECIATION MONTH! Please refer to our Pitbull Specials page for information and pricing! We offer 20% off dental prophylaxis ALL MONTH LONG! Did you know there are many household items that are toxic to pets? Click the link below to for a full list of toxins! For nearly 40 years the Marina Animal Clinic has been providing outstanding veterinary care to the great people of Northeastern Oklahoma and surrounding areas. "Thank you to all of the vets and staff at Marina. You are a wonderful clinic and I would recommend anyone."